My double-barreled PS2 attack from back when both were active systems in my arsenal. One US model, one Japanese. 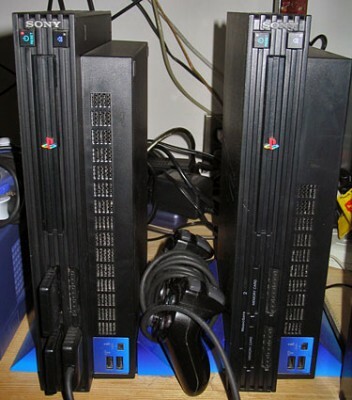 Both are launch systems, and both work perfectly – I know this may shock you given the notorious unreliability of first-generation PS2’s, but I have had no problem whatsoever with either one over nearly four years of pretty active gameplay. 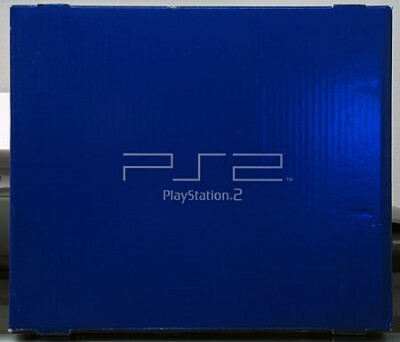 I was pretty shocked when the US model was released with the same plain blue box as the Japanese model. This is almost unheard of in the US. Anyway, I’ve gotten a lot of play out of my PS2’s but I can’t say I’m a big fan of the system. Like the Xbox, it doesn’t really have a soul. It has no identity of its own. It’s just a box that plays a lot of random games from different publishers and developers, as I guess is probably going to be the fashion from now on. Gone are the days when one manufacturer basically controlled the destiny of a console, when a good console would have a completely balanced and controlled first-party game library that all conformed to a “house style”. In other words, I like a lot of PS2 games, but I have absolutely no feeling one way or another towards the PS2 itself – those games could be on any system. There’s absolutely nothing about the PS2 that makes those games unique. To digress a bit, a lot of people wonder why I bother keeping two PS2’s hooked up these days when I could just mod one to play imports. Well, the truth is this: a) they’re not actually both hooked up (I swap the cables and whatnot around when I want to play imports), and b) I actually used to have the import system modded and was so dissatisfied with the results that I literally opened the thing back up and violently ripped the mod chip off the motherboard one day, like it was some sort of cancerous tumor I was expunging from the system. PS2 mod chips have really been a disaster compared to the methods for playing imports on other systems. The only foolproof way of doing it is to just have two PS2’s. Like the original PlayStation, I have a feeling that once I package up the system in favor of the PS3, I will probably never have cause to even look at it again (unless I decide to take some better pics for a site like this). It’s not a system anyone’s ever going to feel nostalgia for, however popular it may be now. I agree with you here too. I never feel any nostalgia for the PS2. And I only ever really seriously played one game on it, and that was Twisted Metal Black, Back in 2001 when I was a HUGE TM fan. Despite having many games for it (that I regret ever buying because I only played a couple hours worth of each one), The PS2 was just a one game system for me.